When faith is a big part of your life and the lives of your loved ones, consider thoughtful religious wishes to impart on the birthdays of your friends and family. Each and every day is a blessing, but birthdays are an extra-special occasion to reflect on God’s many gifts. I have been blessed from the moment you entered this world with your kindness and joyful spirit. You are a gift and my miracle, my son, and I love you so much. Happy birthday! My dearest son, God’s light shines upon you each and every day. 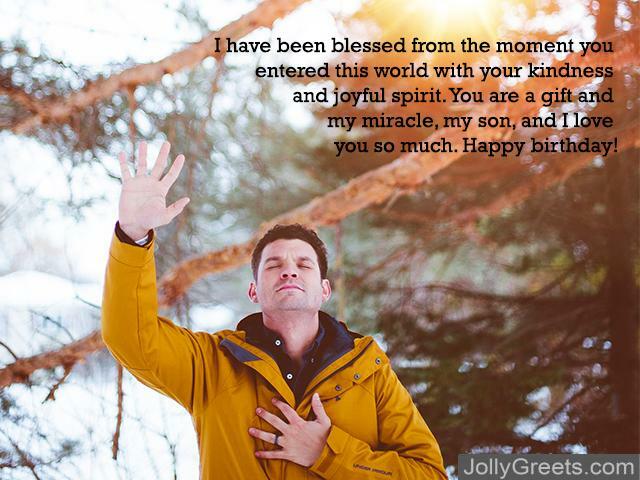 Today, on your birthday, it is a reminder that your birth was the sweetest blessing. I love you so very much, and I wish you the happiest birthday today! My wonderful son, when you were born on this day, I knew that God was with me and had blessed me with the greatest gift I will ever receive. I wish you nothing but love and happiness as you turn another year older. To my beloved son, may the Lord bless you with love and joy today on your birthday. On this day, it’s your turn to receive wonderful gifts from all those who love you, but know that you are the greatest gift I could ever ask for. Happy, happy birthday! From the moment you became a part of my life, I knew I had been blessed by God with a loving, beautiful son. You bring joy to me every single day, and I hope you feel nothing but happiness today on your birthday. I love you! I am so blessed to have a friend like you by my side. Thank you for being there for me through it all! Happy birthday, let’s have a wonderful celebration! My dear friend, we share so many things, but our mutual and undying faith in the Lord makes me grateful for our companionship. Today, I wish you a very happy birthday and a blessed year to come! My close friend, I’m wishing you a very happy birthday and an exceptional year ahead. Your friendship is a blessing and I’m so thankful that the Lord brought us together. Here’s to another year of wonderful memories together! Happy birthday, friend! I am so grateful for your friendship and for our shared love of God. You walk in His light and I look up to you greatly. Have a wonderful day! My beautiful mother, you have shown me what it means to love our Lord and to walk in His light. I am grateful for you, today and every day. Wishing you the happiest of birthdays, you deserve it more than anyone I know. I love you! Mother, I’m wishing you a very happy birthday today! From you, I have learned that the light of God is within us all. Family is one of life’s greatest gifts, and on your birthday today, I’m reminded of how blessed I am to have you in my life. I love you, Mom! Happy birthday to the most incredible mother I could ask for. From you, I learned to treat every single day as a precious gift from God–especially your birthday! Love you, Mom, have an exceptional day. Mom, I truly don’t know what I would do without you! When I am down, you remind me to trust in God’s plan and put love above all else. Your birthday is just another occasion to tell you how much you mean to me. Happy birthday, mom, I love you! God has blessed you with 7 decades of life. You bring love and happiness who all those you encounter, and I am so grateful for your friendship. Happy 70th birthday, may you continue to walk through life in the light of the Lord. Wishing a happy 70th birthday to a true [wo]man of faith. Having you in my life is one of God’s great gifts to me, and I love you very much. Thank you simply for being yourself, may you have a wonderful celebration today. For 70 years, the world has been blessed with your kindness, compassion, and beautiful spirit. May God bless the years that are to come for you. Happy 70th birthday! Happy 70th birthday to one of my dearest friends. With our commitment to faith and our love of God, we can do anything! 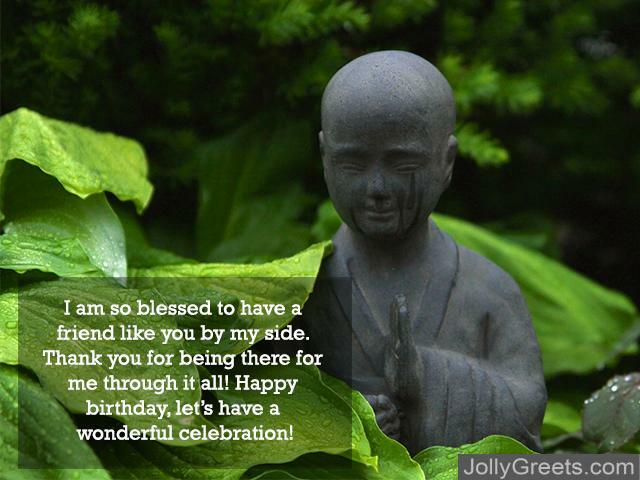 Have an absolutely wonderful birthday celebration, and may the year ahead bring you many blessings. Wishing an amazing birthday to my one-of-a-kind father! Your commitment to our Lord and to our faith is endlessly inspiring to me. Thank you for everything, I love you so much! Happy birthday, Dad! You’re the best father I could ever ask for. You have taught me what it means to walk in the light of the Lord and to live for His love. Love you so much. Dad, today is your birthday and I hope you have a terrific celebration. You have shown me what it means to truly have faith in our Lord and trust him entirely, even when the world seems dark. I love you, Dad, happy birthday! Happy, happy birthday to my incredible father. Dad, you show me each and every day what it truly means to be a man of faith. You set an example of how to trust in God and live a life in the light. I love you! Dad, may you have the happiest of birthdays and a blessed year to come! I admire you greatly for your undying commitment to God and for your determination to live a life in His light. The next time that someone you love has a birthday, celebrate the day that God put them on this earth with a loving, meaningful message. 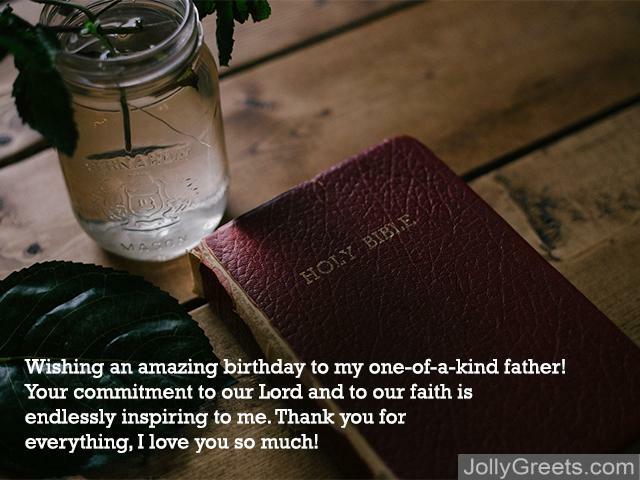 May your shared love of the Lord strengthen your bond and bring happiness to a special birthday!